It's been slim pickings at my local dollar store for Easter items, especially baskets. I did come across decent plastic ones though. They are a solid color but resemble a wooden barrel. Cute, but in desperate need of some creative touches and personalization. I used my Cricut to cut my kids' names out of adhesive vinyl. If you don't have a Cricut it is possible to create, but would take a lot of extra work. I highly recommend one if you're into personalizing things. I cleaned the buckets with alcohol and applied the names using transfer paper (clear shelf liner works great) and my Cricut scraper. A bit of rubbing and it's on there. I was liking the white on the bold colorful baskets and thought it needed something more, something else white. Then it hit me - bunny tails! I haven't seen any in stores yet so I opted for pom-poms. I had just enough white yarn and other supplies on hand to create two. See my tutorial here. 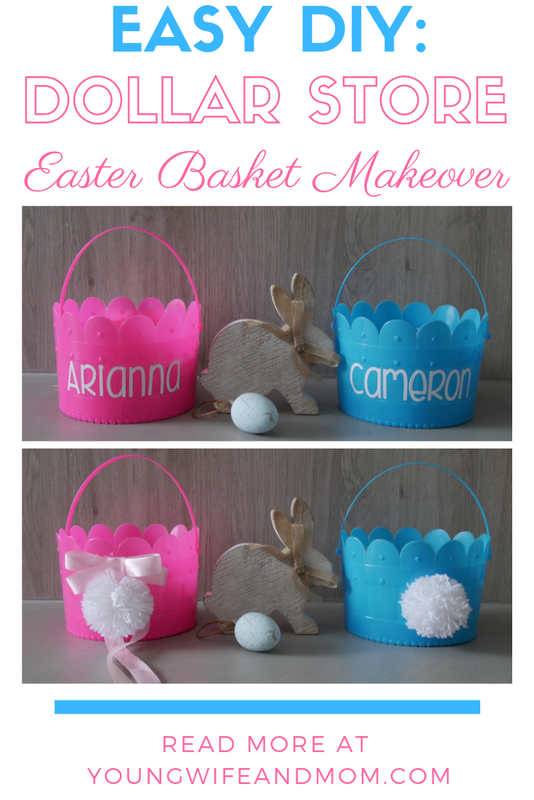 I hot glued them on the back of the baskets and added a handmade pink bow for my daughter. While I feel like they could still use a liner or SOMETHING else to finish them, I'm satisfied for now. Let me know what you think and if you have any ideas I should add to them.